We are proud to now be offering Ipe flooring! Also known as Brazilian Walnut flooring. The last flooring you will ever need to buy. Ipe is world renowned for being one of the densest woods in the world. This is why it is great for creating a sound barrier. Ipe is well known for being naturally scratch, insect and fire resistant. In fact, it has a class “A” fire rating. Often times nowadays people us cheap or even sometimes pretty expensive laminate floorings that try to look like real wood. Ipe is a real wood and is the highest quality of wood available. When looking at your ipe floor no 2 boards are the same. 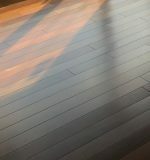 The grain is absolutely gorgeous and the reason fake woods try to look like natural wood is simply that, nature makes the most gorgeous flooring.